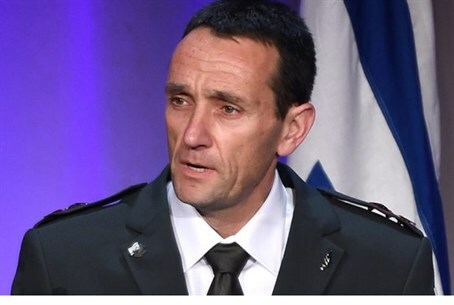 IDF Military Intelligence chief Maj. Gen. Hertzi Halevi warns FIDF gala audience that internal violence along Syria's borders is growing. The FIDF raised $24 million, as more than 1,200 prominent business and philanthropic leaders from across the country gathered at New York’s Waldorf Astoria hotel to demonstrate their love and support for Israel’s soldiers and FIDF. Special guests included 30 IDF soldiers of various ranks and military units, including Second Lt. Inbal, an educational officer in the Artillery Corps, whose brother, First Sgt. Avi, was shot and killed in Bet Hanoun, near Gaza, during Operation Protective Edge this past summer. Addressing the audience, Second Lt. Inbal shared her personal memories of her brother, who posthumously received a citation for his bravery. Most of the soldiers who attended the Gala received citations for heroism, including in Operation Protective Edge and Operation Pillar of Defense. Distinguished guests included author and nationally syndicated radio host, Dr. Monica Crowley, who served as the evening’s host; IDF’s 19th Chief of the General Staff, Lt. Gen. (Res.) Gabi Ashkenazi; Israel Defense and Armed Forces Attaché to the U.S. and Canada Maj. Gen. Yaacob Ayish; Consul General of Israel in New York Ido Aharoni; and former Israeli Ambassador to the United States Danny Ayalon. Other prominent guests included FIDF National Chairman Nily Falic; FIDF National Director and CEO Maj. Gen. (Res.) Meir Klifi-Amir; Rabbi Weintraub and his wife, Ellen; FIDF Chairmen Emeritus Arthur Stark,Larry Hochberg, and Marvin Josephson; FIDF National Director and CEO Emeritus Maj. Gen. (Res.) Yitzhak (Jerry) Gershon; and FIDF National Board Member and YL-NY President Emeritus Tony Felzen. Israel’s Prime Minister, Binyamin Netanyahu, greeted the audience via satellite, and thanked them for their invaluable support for Israel’s soldiers. $24 million was raised by the evening’s end. Notable among the donations was a $2 million anonymous matching gift made towards the FIDF Formal Education Program, which allows soldiers to complete 12 years of high-school education as part of their military service. In addition, $5 million was pledged by The Marcus Foundation with Nefesh B’Nefesh to benefit Lone Soldiers; $1.5 million was pledged by President of FIDF NY Young Leadership (YL) Lemor Bar-Or, on behalf of YL-NY; $1.3 million was pledged by Genesis Philanthropy Group North America; $1.2 million was pledged by the FIDF NY Real Estate Division; $1 million was pledged by Beit Morasha of Jerusalem for Identity and Purpose Programs; $1 million was pledged by Israeli Journey; $600,000 was pledged by the Iranian American Jewish Federation (IAJF); $500,000 was pledged by Hope for Heroism; $500,000 was pledged by Nily Falic; $400,000 was pledged by Joseph Weintraub, Rabbi Weintraub’s son; and $330,000 was pledged by former FIDF National Dinner Chairman Benny Shabtai. Funds raised at the gala will provide much-needed and well-deserved services such as academic scholarships to former combat soldiers, financial support for underprivileged soldiers and Lone Soldiers from around the world, crucial aid for wounded veterans, weeks of rest and recreation for entire IDF units, as well as educational, cultural, and recreational facilities. The evening was a rare and exclusive opportunity to pay tribute to the State of Israel and the brave men and women in uniform. In 2014, for the first time in its history, FIDF raised over $100 million for the well-being of Israeli soldiers.